Mark Artrip, who directs high school ministries for Grace Church, the Grace Brethren church in Powell, Ohio (Rick Nuzum, pastor), has sent along this report. On Wednesday April 7, Grace Church in Powell, Ohio, was the site of a North Central Ohio district worship night with more than 350 people in attendance. Youth groups from Grace Brethren churches of Columbus, Grace Fellowship in Pickerington, Northwest Chapel, Grace Church, Marysville Grace, and Lexington GBC all participated. Music was provided by members of the worship ministry at Marysville including Jeremy and Terra Bury, Chis Solyntjes, the worship director at Western Reserve Grace Church, and Dan Hermiz, worship director at GBC of Columbus. In the middle of the evening Pastor Clancy Cruise of Marysville shared his heart for Africa and an offering was taken to help support the training of youth workers in the Central African Republic. The offering was doubled and $1250 will be sent to the CAR. 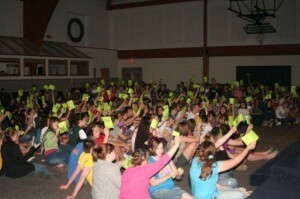 The picture with the yellow papers in the air is everyone holding up a prayer guide committing to pray for Africa.